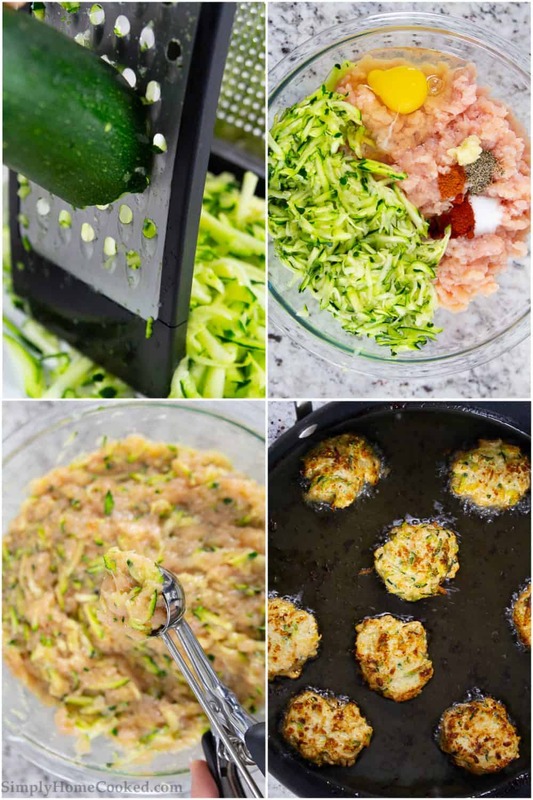 These Chicken Paleo Zucchini Fritters are so delicious you won’t believe that they’re gluten-free, paleo, and whole 30 approved! Follow my flavor-packed recipe for a tasty meal! If you don’t care for the zucchini in these, check out our simple chicken croquettes for a similar idea! This recipe was originally posted June 7, 2018, we’ve tweaked it a bit since then. This post may contain affiliate links. Read my disclosure policy here. 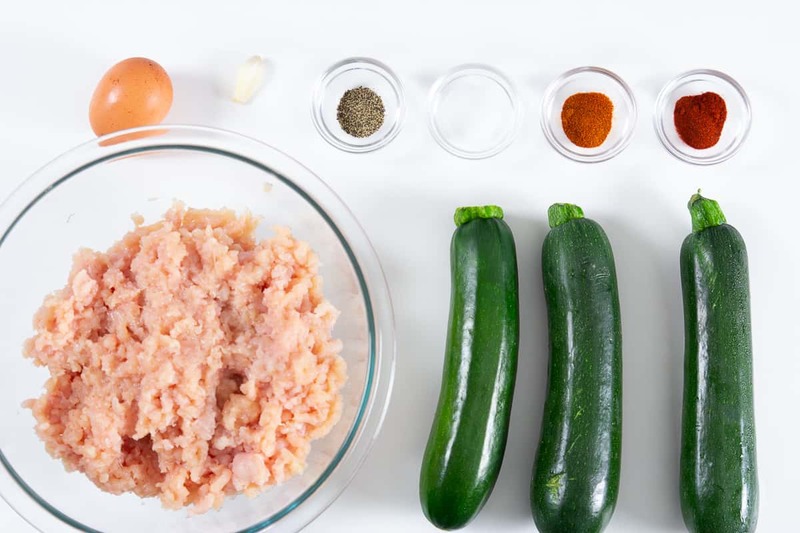 Change up your dinner routine with these easy chicken paleo zucchini fritters. It’s the perfect cross of a chicken fritter and zucchini fritter but better! Kids love them, especially with sour cream or my homemade Ranch dressing. And the best part, they’re super healthy (paleo, gluten-free, and whole 30 approved). You get your antioxidant from the zucchini, protein from the chicken breast, and a ton of flavor from the garlic and spices. What’s not to love? If you prefer zucchini fritters vegetarian (without the meat), be sure to give these greek zucchini fritters a try! This post may contain affiliate links. Read my disclosure policy here. This recipe was originally posted on Jun 7, 2018, we’ve tweaked it a bit since then. Meat– chicken breast, or chicken thighs. Prepare your zucchini as directed in the printable recipe below by grating it and squeezing all juices out so the zucchini isn’t overly wet. I use a box grater for this process. Next, you will combine ingredients as directed and portion using a cookie scoop. Cook as directed and serve with your favorite dipping sauce. 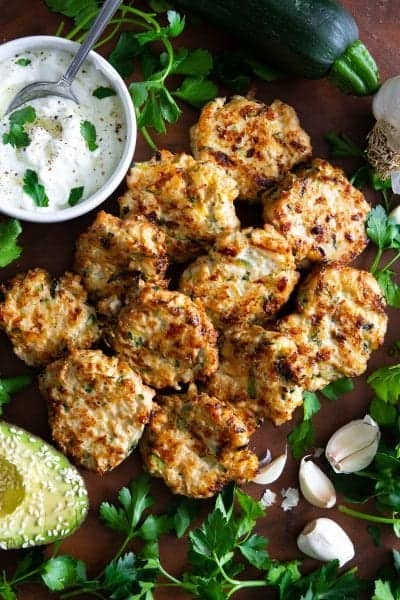 We love to dip the chicken zucchini fritters in Greek yogurt sauce. Or add them as a side to our garlic zucchini pasta, since zucchinis are abundant in the summertime. We also love to add it to other simple pasta dishes like our cheesy baked orzo. These Chicken Paleo Zucchini Fritters are so delicious you won't believe that they're gluten-free, paleo, and whole 30 approved! Follow my flavor-packed recipe for a tasty meal! Shred 2 1/2 cup of zucchini with a grater. Squeeze the juices out and place into a large bowl. Place the ground chicken, egg, pressed garlic, salt, black pepper, smoked paprika, and cayenne pepper into bowl of shredded zucchini. Mix until all ingredients are well incorporated. In a skillet, pour enough oil to over the entire surface of the pan. Bring the heat to medium high heat. Scoop the zucchini and chicken mixture using a cookie scoop and place into the hot oil. Cook each side for about 3-4 minutes or until golden brown. Serve warm with ranch or sour cream. Do you precook the chicken? Hi Teri, I do not pre-cook the chicken. Haven’t made them yet but they sound yummy. Can they be frozen before frying? Or would it be better to fry then freeze and just warm them in the oven when you’re.ready to eat.